CytoCulture has developed monitoring techniques to evaluate its bioremediation projects for petroleum hydrocarbons throughout the past 10 years. Now, microbiological assessments are an essential part of any remediation evaluation, especially with the recent emphasis on "intrinsic bioremediation" or "monitored natural attenuation". New techniques have been developed to evaluate anaerobic microbial activity at sites, as well as the metabolism of chlorinated solvents and aromatics. Our chemical laboratory services fall into two levels. The first level is our field based chemical assays for nutrients, electron acceptors, and DO/redox/pH measurements. These tests are ideal for active bioremediation programs, and for site evaluations that do not require state-certified laboratory work. The advantage of these assays is that they are cost-effective, and can be performed with a fast turnaround time for making field decisions. The second level of chemical monitoring is for larger scale evaluation programs requiring more complex chemical analyses from state certified laboratories. 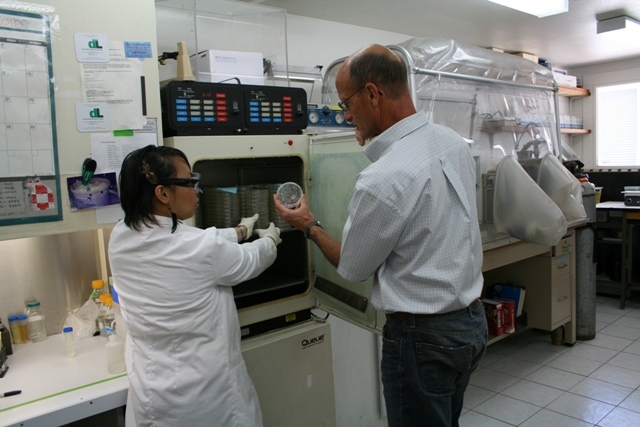 For these monitoring projects, we combine our microbiological assays with subcontracted chemical and gas analyses from collaborative full-service state-certified laboratories. The advantage of having CytoCulture manage your laboratory monitoring effort is that we can provide one quote including all of your biological, chemical and gas analyses needs for a given site. We also will provide technical advice and interpretation, as well as coordinate all of the analytical details including sample containers, hold times, and reporting. General Microbial Assays. There are several means of determining general or total populations of bacteria at a site. These assays are used to monitor site conditions favorable for bacteria or population changes relative to site chemistry (natural or induced). These assays will also provide evidence for microbial activity, and can indicate zones of microbial inhibition. Total heterotrophic plate counts (anaerobic or aerobic) determine the total number of bacteria able to grow on a wide variety of carbon/ energy sources. Direct Counts use microscopy to more accurately determine total bacteria in a sample. Most Probable Number (MPN) assays determine population numbers of specific groups of anaerobes, such as sulfate, iron, manganese or nitrate reducers, or methanogens. These groups will have different biodegradative activities and rates and are active in the absence of oxygen. Contaminant-Specific Microbial Assays. Direct evidence for populations of contaminant-degrading bacteria can be obtained with specialized enumeration assays. For fuel and BTEX contaminated sites, hydrocarbon degrading bacterial plate counts can enumerate populations of bacteria that have the ability to degrade gasoline, jet fuel, diesel, and/or other hydrocarbons added to the growth matrix. MPN and plate count techniques have also been adapted for the determination of populations of more specific contaminant-degraders (e.g. benzene, PCB, or TCE degraders). More advanced genetic and biochemical methods, such as PCR, fatty acid analyses, and genetic probes, have also been developed for characterizing bacteria capable of specific contaminant degradation activities. More direct evidence for significant site biodegradation activity may be required for more recalcitrant contaminants (e.g. non-petroleum compounds or mixed-contaminants), for contaminants which can biodegrade to more mobile or toxic compounds, or for sites with a short monitoring history (OSWER, 1997). In cases such as these, the EPA recommends laboratory microcosm studies in order to demonstrate site specific biodegradation activity. 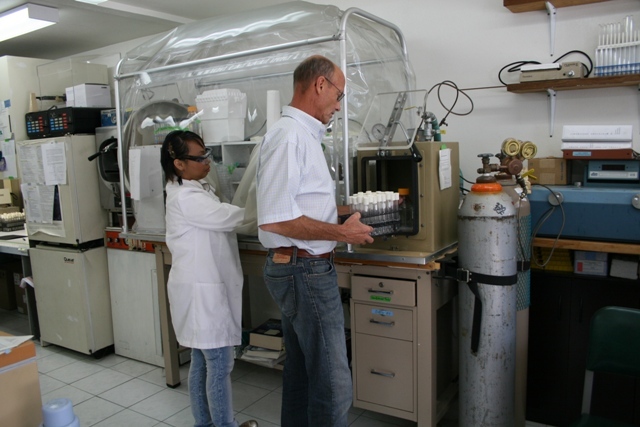 Microcosm studies (often called treatability studies) are laboratory simulations using site groundwater, soil, microbes, and contaminants incubated over time. Information such as microbial byproducts, biodegradation rates, and most favorable electron acceptor conditions (aerobic vs. anaerobic) can best be gained by these studies. These microcosm studies are usually performed on a research basis, and are developed using the information gained from initial monitoring events.